We design photorealistic broadcast quality virtual backgrounds for chromakey, a.k.a.virtual sets. We typically provide low and medium budget productions with affordable tools to create high quality products using popular video editors. Beyond your own creative ideas, all you need is an HD quality digital camera and a computer with green screen enabled video editing software. While our sets are primarily used in post production, please note that we can easily convert our virtual sets into a real-time rendered 3D model with baked in lighting for use in live broadcasts from multi-million dollar virtual studio systems. 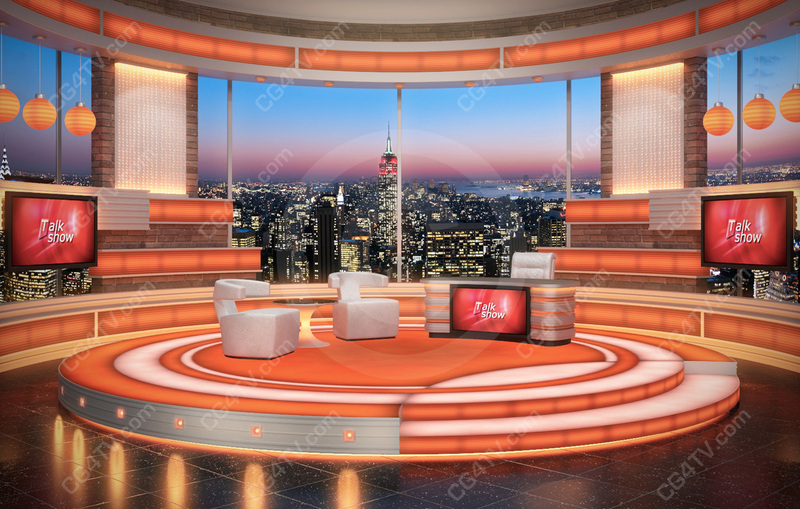 Download free sample virtual sets — Visitors to our CG4TV site can easily try out a virtual studio set prior to buying. Get chromakey test files absolutely free: download full-resolution virtual backdrops for full body standing presentations as well as a studio with a news desk. The intention of our free test files is to provide you with a sample to import into your video editor to make sure it works great for your production needs. Please note that our off the shelf virtual sets in our store have far more layers and carry no watermark. Our step-by-step green screen video tutorials show how easy it is to use our green screen backgrounds and v-sets when used with popular video editors such as Adobe After Effects and Final Cut Pro. As the files are standard .pngs image files with alpha channel transparency, our virtual sets will work with most editors and video systems, post production as well as live broadcast. You will find answers to most of your further questions by visiting our Free Downloads and Video Tutorials. In case you do not find the answers you seek there, please check out our FAQ page or contact us by email at info@cg4tv.com. Note: Most clients, cooperating with us, employ our exquisite LIVE broadcast virtual news studios, weather sets, and animations with Tricaster and other hardware and software-based studio systems broadcasting LIVE through chroma keying. Our “news magazine” style TV program is a 60-minutes or more broadcasting featuring mainly hard-hitting news. In late February 2010, our company plans our first program to be on air. To develop our project, we took advantage of Apple Final Cut Studio 2, Adobe Photoshop CS4 and Ultimatte AdvantEdge. Finding the right aesthetic environment harmonized with the brand is the most important issue when starting a new TV program. Our staff spent a few days searching virtual sets, comparing various software and design studios. Among others, we almost instantaneously noticed the company possessing the best sets.CG4TV.com presents high-resolution images which are vivid and sharp matching the expertly processed images we were going to find. All downloadable files complimented with alpha channels provide our graphic designers with a possibility to add more elements, making the image deeper and more realistic. Due to our limited budget, we can only do all the keying during the post-production process. This approach allows us to improve our graphics and match them with the virtual sets. We were striving to achieve more than just a flat straight camera angle, so matching the angles was quite a challenge. Setting up lighting and getting our cameras to perfectly match the virtual studio set consumed plenty of time, but as soon as it was done, the results were just amazing. Apple Motion application helped us to layer shadows, zooms, and pans. We had to spend more time for the post-production process, though our effort resulted in taking image realism to the whole new level. The program’s production value and feel increased due to this virtual studio background utilization. Our task was to find a quick inexpensive solution to meet national television standards when creating our completely new This Week In Space TV show actually produced on our laptop. 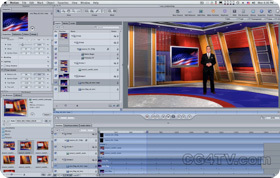 CG4TV.com’s online store offers their exclusive virtual studio and background. For the time being, we take advantage of it in our every show to create everything starting from titles and finishing with commercials. 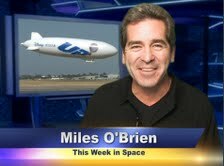 To say more, virtual sets appeared to be a very convenient solution for Miles O'Brien, our globally known television anchor. Because of his busy journey schedule, he is hardly ever available for a real physical set. At present, he just takes an easily portable green screen along, makes footage of his parts on the road, and we match the footage with the same set to achieve consistency, so it doesn’t really matter which part of the world Miles is visiting at this or that time. With minimum investments in the CG4TV virtual studio and perfect green screen backgrounds, our company achieved a vigorous growth hitting the top list in iTunes, made the Google/YouTube Company ask us to cooperate with them, and attracted a whole lot of noted mass media to join our TV show. Videography is facing a pivotal green screen revolution in some time soon. Forget about plaid-coated last-century weather forecasters! 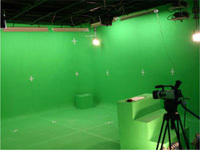 Many major motion pictures like the recent Sin City, Star Wars trilogy, Sky Captain, and 300 take advantage of the green screen studio backdrops and backgrounds. Large Hollywood studios do not have to build huge expensive production sets anymore. Producers can now create top-quality virtual film sets, employing chroma key software and green screen backgrounds instead and saving huge production costs worth millions of dollars. However, that is not all. The revolution of green screens has expanded far beyond the large motion picture studios. Nowadays, anyone possessing a powerful computer, good video camcorder, and a portable green screen backdrop is able to achieve amazing expert-level results, using revolutionary virtual sets and some other innovative production means like elastic backgrounds. To tell more, everything can be done with a minimum budget. Consequently, virtual studio sets and green screen backgrounds implemented in complex solutions show up everywhere – in low budget TV production, talk shows corporations, schools, and as a host for third-party applications. Moreover, feel free to try our animated backgrounds, for example, the American flag background..